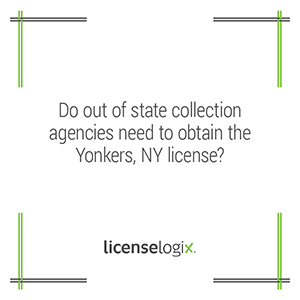 The City of Yonkers, N.Y requires all collection agencies obtain a license. (Article XVIII) Section 31-158 of the Yonkers Consumer Protection Code states, "It shall be unlawful for any person or business to operate a debt collection agency without first procuring a license from the City of Yonkers." Any debt collection agency attempting to collect from a resident of Yonkers. The license fee is $150 for a one-year term. New York does not currently have a statewide licensing requirement, although recent legislation suggests that could change by 2015. Currently, New York City and Buffalo, NY, also require local debt collection agency licenses. LicenseLogix will begin the process to get your collection agency licensed in Yonkers, NY TODAY. To get started, contact us here or call us at 1800-292-0909.